OMP kickoff event "This Is Miami" is Saturday night at AE District from 8 to 11 p.m.
Music, dance, laughter, and joy were what filled the streets of Overtown in earlier years. But today, most people tend to stay away from the Miami neighborhood due to its high crime rates and infamous rap sheet. Amy Rosenberg, organizer of the Overtown Music Project, decided that it was time to change this common view. OMP is a series of fundraising events launching this fall designed to help bring the public together. The City of Miami has long been interested in helping restore the community from an underserved, low-income neighborhood to the lively middle class society it once was, and OMP may be just the thing to nudge that effort in the right direction. 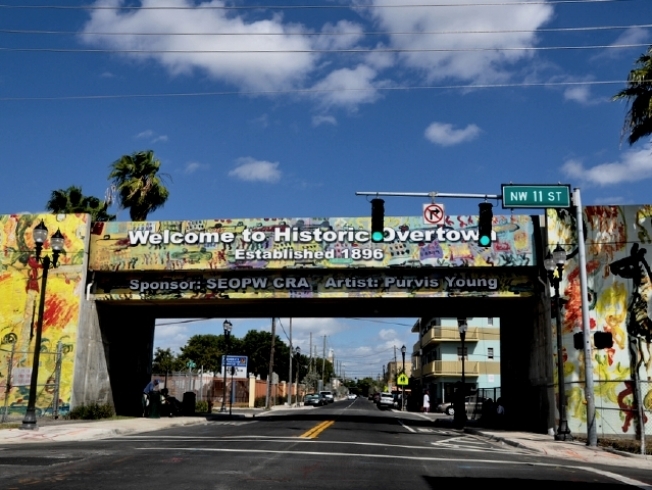 Rosenberg explains that Overtown was known as the “Harlem of the South” thanks to the numerous night clubs, hotels, theatres, and restaurants that once sat on what was known as “Little Broadway." Though the OMP series doesn't begin until fall, its kickoff event, "This is Miami," gets underway tonight at 8. Carmel Ophir, who owns Overtown's Vagabond nightclub, will spin Motown at OMP. Internationally known saxophonist Charles Austin will headline among other musicians and luminaries, and soul food guru Vivian Dunn will be on hand (and on plates) along with well-known community leader Ruth Shack. Rosenberg was inspired to begin this project by the memory of her grandparents, both Holocaust survivors. Her grandfather had an African-American business partner, a very uncommon practice in those days, and as a child her family dinners consisted of an interracial Jewish supper with gospel music in the background. Rosenberg hopes that the efforts of the community in aiding the organization of OMP will be heard and turn around the “common thought” that comes to most Miamians when speaking of Overtown. "This Is Miami" is expected to be filled with laughter, music, food, and funk – reviving what Overtown once was. Look for the party at AE District starting at 8 p.m. Tickets are available at the door for $25. Proceeds will be used to provide scholarship funds for a student who wants to pursue a music program in a local university and for future event programming.